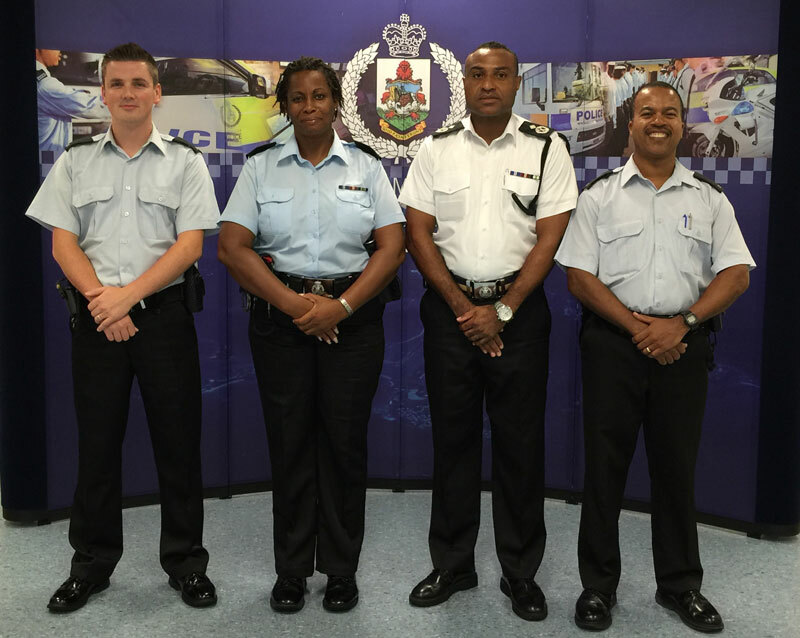 Yesterday [Sept. 2], Assistant Commissioner of Police Antoine Daniels congratulated three members of the Bermuda Police Service who have recently and successfully completed an intensive eight day training course to become instructors in the G.R.E.A.T. [Gang Resistance Education and Training] Programme. “The programme a joint initiative between the Ministry of National Security and The Bermuda Police Service was reintroduced into the Islands schools in 2014, and since then has experienced tremendous success,” a police spokesperson said. “The three Officers PC’s Dawnette Walker, Derek Simmons and Keegan Taylor travelled to West Hampton, New Jersey, and along with over 20 Officers from across the US took part in intensive training; focusing on teaching techniques, classroom management and cooperative and interactive learning techniques. “The training will enable the officers to join the ranks of the eight other Police Officers currently delivering the G.R.E.A.T curriculum to the Island’s Primary and Middle Schools. Premier and Minister of National Security Michael Dunkley said, “I want to extend my congratulations to the three officers who recently completed their GREAT instructor training. “We are about to embark on a new school year, and having the Gang Resistance Educational And Training programme in our schools has made an incredible impact in the lives of our young people. “I want to thank the Bermuda Police Service for their continued dedication to GREAT and for teaching our young people about better alternatives to gang violence and anti-social behavior,” the Premier added. The three Officers commented on what a “GREAT” experience it was to be able to mix with colleagues from other jurisdictions. They added that they learned a considerable amount and are very much looking forward to putting their newly acquired skills to good use helping to develop meaningful relationships between Police Officers and Bermuda’s young people. Ronnie Chameau: Wow, the Fairmont really went to the extreme for their guest how wonderful. PANGAEA: The vast majority of drivers in this island are exceptional.We can save many lives by example.